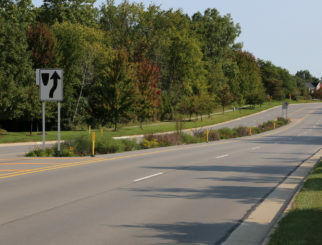 Spalding DeDecker (SD) was retained by the City of St. Clair to evaluate alternative roadway geometry for M-29 (N. Riverside Dr.) between Clinton Avenue and Vine Street within the City of St Clair. The alternative geometry was developed based on previous planning and research efforts provided by SD in 2003-2005 and input from City personnel toward implementing their long-term vision for the M-29 corridor and the Downtown Business District. M-29 is under the jurisdiction of the Michigan Department of Transportation (MDOT). Traffic volume and speed data were collected and analyzed to determine Level of Service (LOS) for through traffic as well as intersection operation at Trumbull, Jay, and Vine streets for existing conditions and compare them to proposed modifications for the corridor. 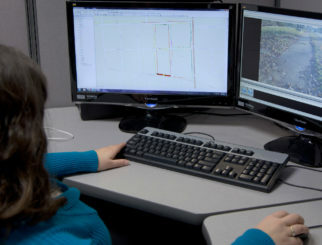 SYNCHRO Version 7 software from Trafficware, which utilizes the methodologies of the Highway Capacity Manual (HCM), is used to analyze the traffic conditions and calculate the travel speeds along the corridor for the various scenarios. Traffic volumes are projected to 2020 to forecast future levels of service. 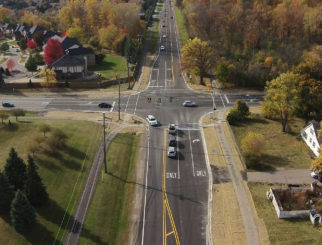 Recommended treatments had to satisfy MDOT’s safety and geometric requirements, while helping the City of St. Clair meet their downtown improvement goals. The proposed modifications include the construction of an 11-foot-wide median boulevard with northbound to westbound turning movements permitted at Trumbull, Jay, and Vine streets.